Keeping your house in order can be a daunting task, particularly in today’s fast-moving world. Children having to go to soccer practice, working full-time, making dinner, and a bevy of other daily activities can limit the time and energy we have for cleaning. 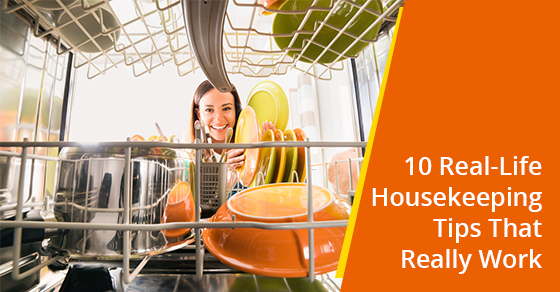 Here is a list of 10 housekeeping tips that actually work to keep your house in good order. We will start with a couple of general tips followed by some specific cleaning tips. Dedicate around 30 minutes each day to cleaning. Once a house is clean, maintaining the clutter and mess a few minutes each day will keep your housing I good order 24/7. This will keep you motivated and prevent a mess from piling up. Trying to clean an entire house at the same time is similar to multitasking. While it sounds great, it actually slows you down. Focus on one room at a time and you will save time! Toothpaste is not just for your teeth. Have your children mistaken your wood floors for a coloring pad? Marker stains can be erase with toothpaste mixed with a little bit of water! That dreaded garbage disposal smell can be eradicated with lemons. Throw some lemons rinds into the disposal with some cold water and let it run for about 30 seconds. Smell eliminated! A wet sponge or cloth and a little baking soda is perfect for cleaning your walls from scuff markers or those times when it become a canvas for the kids. Baking soda is great for combating feet odor in shoes but also for pet odors on furniture. Simply sprinkle some on your couch, chairs, and rugs. Let it sit for about 15 minutes and simply vacuum up those odors. Clean the edges of the dishwasher with baking soda and a wet sponge. Once a week, run the dishwasher empty with an EPA-approved disinfectant. This will sanitize the dishwasher and rid it of any bacteria such as E. Coli. Cleaning the oven is one of the least desirable cleaning events to accomplish. You can make this easy by using a non-stick oven liner. Simply remove the liner and wash it in the dishwasher! Besides being costly and filling up your garbage, paper towels are not reusable. Use microfiber cloths as a replacement. They can clean and sanitize anything, are washable, and are increasingly becoming more inexpensive. Place some coffee grounds in a container in your fridge to rid it of ugly odors. A bowl of coffee grounds should last a couple of months so this is a great, inexpensive way to keep your fridge fresh! Housekeeping does not have to be a complicated process. Keeping your house in good order can and should be easy as pie. To learn more about how to clean your home better, contact Sunrise-Cleaning today.